LONDON, England - Having missed out on one Brazilian, Manchester City could now be in danger of losing another one. 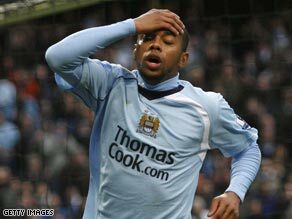 Robinho, a big money summer signing from Real Madrid, is so disappointed at City's failure to land Kaka from AC Milan that he has fled to Brazil and is determined to leave the club whatever the consequences, according to the Sun. Could Robinho be on the brink of quitting Manchester City after just half a season? The Brazilian's agents are reported to be looking to secure him a move before the end of the January transfer window - with Luis Felipe Scolari's Chelsea set to pounce if the player becomes available. Meanwhile, Didier Drogba has dropped further hints of his desire to quit Chelsea after telling French newspaper La Provence that he has "unfinished" business at his former club Marseille. "I still love this club and it will never change, whatever happens," Drogba said. "It's not necessarily the right moment for me to speak about a possible return... If something is made to happen, I don't know on which conditions, Marseille are going to have to contact Chelsea... I have not opened the door to a possible transfer, I've simply explained the situation." Another player who could be deemed surplus to requirements at Stamford Bridge is French winger Florent Malouda - with Villarreal preparing a £9 million bid, according to the Daily Mirror. Atletico Madrid have become the latest club to express an interest in Lyon's Fred with Marca reporting that the Spaniards are looking to sign the Brazilian striker when his contract expires in June. The French champions are looking at another Brazilian striker, former international Ricardo Oliveira, currently banging in the goals for Real Zaragoza, l'Equipe reports. Finally, Arsenal continue to suffer frustration in their pursuit of Andrei Arshavin with Zenit St. Petersburg refusing to drop their £18 million valuation, the Daily Telegraph reports. The Gunners have bid £12 million for the Russian playmaker; Zenit could yet be persuaded to do business for £15 million the paper says.